About Bears and You . . .
Black Bears are common throughout the Wind River Range. Although a Grizzly encounter is possible, it is unlikely. Grizzly habitat is typically to the north and east of the Pinedale area. Black Bears are not as aggressive as Grizzly Bears and most often want to avoid you. The Pinedale Ranger District has a pamphlet which describes the physical differences between Grizzly and Black Bears which can help you know which type of bear you may be dealing with. If you are above tree line, store attractants in doubled plastic bags, as high and as far from your camp as practical. Remember that things like toothpaste, cosmetics, deodorant, canned foods & beverages, pet food, horse pellets and animal carcasses care also bear attractants. When people do not store their food and garbage properly, a bear will quickly learn that this is an easy meal. Once a bear has become habituated to human food, it loses it's fear of humans. Bears that seek food at campsites may be removed from the area or destroyed. 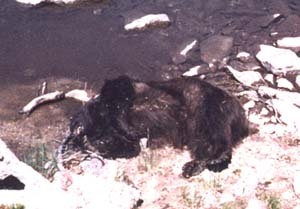 The bear in this photograph was shot and killed after it entered a camp where food and garbage were improperly stored. You can prevent scenes like this from happening by storing food and garbage correctly while camping.